Philip Treacy's exhibition "Hats in the 21st Century"
Born in rural Ireland in 1967, Philip Treacy was the second youngest of eight children of a baker in the Galway village of Ahascragh. He initially studied at the National College of Art and Design in Dublin in 1985 before moving to London to study millinery at the Royal College of Art. His acclaimed graduate show in 1990 resulted in offers to collaborate with international designers such as Valentino, Versace, and Karl Lagerfeld at Chanel, with whom he worked for ten years. The first hat he designed for Chanel was the twisted birdcage, photographed by Patrick Demarchelier for the cover of British Vogue. The same year he established his own company, Philip Treacy Limited, and went on to win the title of Accessory Designer of the Year at the British Fashion Awards in 1991, 1992, and 1993 and again in 1996 and 1997. The dramatic power of his designs has meant that they appeal to extraordinary, iconic women such as Isabella Blow and Grace Jones. Renowned for her ability to spot and nurture talent, Isabella Blow is probably the most extreme showcase for his work. She first encountered his hats when working with the fashion editor Michael Roberts at Tatler magazine, and on Treacy's graduation invited him to set up a workshop in the basement of her house on Elizabeth Street, Belgravia, London. In 1994 he opened his own shop at 69 Elizabeth Street. Among Blow's other protégés was Alexander McQueen, with whom Philip Treacy collaborated in 1999 on his haute couture collection for Givenchy, which included hats constructed from gilded rams' horns. Philip Treacy identified 1993 as the year that signaled a new attitude to millinery, resulting from the production of his first annual catwalk show at London Fashion Week. The showcasing of millinery as a design item independent of garments has led to a revival of interest in the wearing of hats. According to Isabella Blow (2003), "In the old days, people were frightened by my hats. But in the last year, or maybe two, Philip has single-handedly broken through the barriers." Treacy has transformed the hat into an art form. His signature style of playful surrealism allied with complete mastery of the craft skills inherent in millinery has resulted in a unique reputation. Drawing on diverse subjects, from orchids to Andy Warhol, Philip Treacy continues to receive universal acclaim from both fashion press and buyers. Although his couture designs may be extreme in concept and not suitable for everyday wear, Treacy also designs a ready-to-wear line which retails through department stores, and in 1997 he launched an accessory collection that includes hair ornaments, scarves, bags, and gloves. In 2000 he was invited by the Chambre Syndicale de la couture, the governing body of French fashion, to participate in the haute couture show, the first millinery designer to do so in seventy years. Evidence of the broad appeal of his aesthetic, Treacy exhibited at the Florence Biennale in 1996, and in 2001 he collaborated with artist Vanessa Beecroft on an installation at the Venice Biennale. In 2002 the Royal College of Art awarded him an honorary doctorate. See also Extreme Fashions; Women's Hats; Milliners. Blow, Isabella. "Tasmin Blanchard 'Blow by Blow.'" The Observer (23 June 2003). Blow, Isabella, Philip Treacy, and Hamish Bowles. 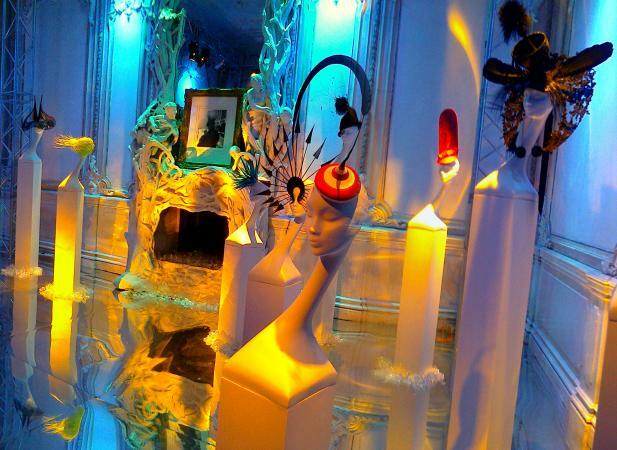 Philip Treacy: When Philip Met Isabella. New York. Assouline Publishing, 2002. An exhibition catalog.